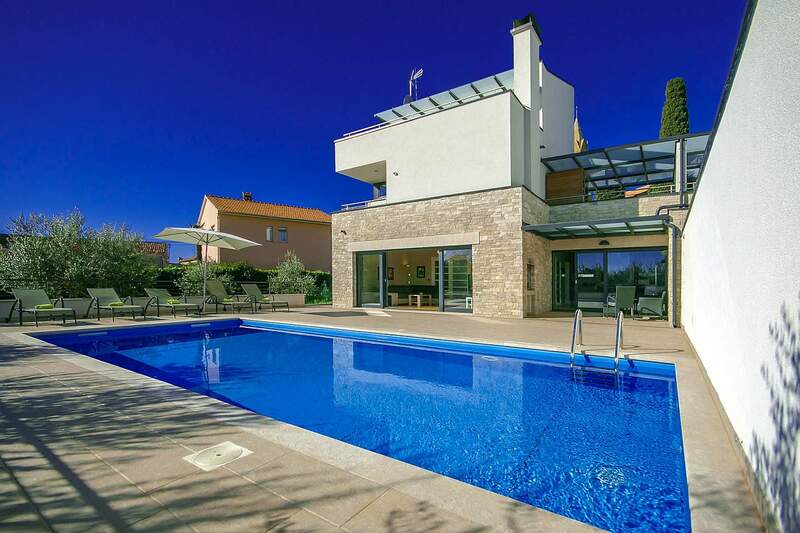 Villa Nina is an attractive semi-detached holiday house on three floors located in the centre of Valtura, a small village 4 km from the sea and 10 km from Pula, the economic centre of Istria. The house has been built in the year 2015 in modern architectonic style and it has an own, 1.000 sqm large, ground with olive grove, 40 sqm large private pool, 2 parking places and a spacious terrace with barbecue and a sitting set. Villa with pool for 6-8 persons with a total indoor area of 140 sqm on three floors and 50 sqm terraces. At the ground floor there is a nice living room with exit to the terrace and the garden, separate kitchen with dining area, separate toilet and a pantry. At the 1st floor there are two air-conditioned double bedrooms, both with terrace of which one with double bed and one with two single beds, bath/toilet in the corridor. At the 2nd floor there's a spacious double bedroom with a double bed, air-conditioning, shower/toilet and a large window towards the terrace of 23 sqm with a stunning panoramic view on the sea and a whirlpool.